Male giraffes range from 16-20 feet and female giraffes average 15 feet in height. Giraffes in Kenya's Nairobi National Park. The giraffe (Giraffa camelopardalis) is the largest rudimentary animal and the tallest of all land mammals. 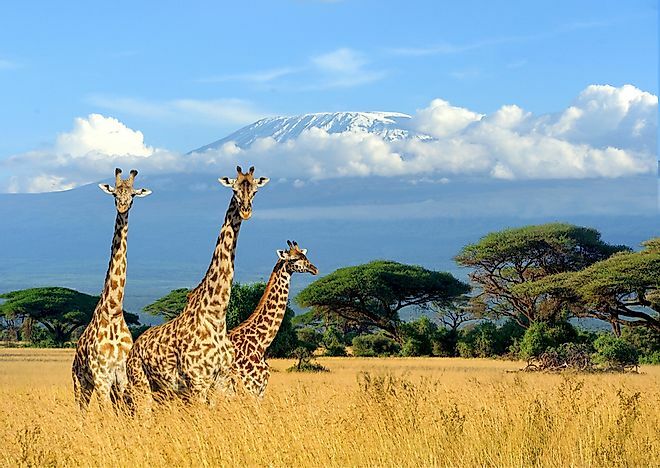 Giraffes occupy the open grasslands and savannah woodlands of Central, East, and South Africa. They are social animals and tend to live in herds of as many as 44 individuals. The distinctive characteristics of giraffes include its long neck and legs, horn-like ossicones that differ between sexes, and unique color and coat patterns. An adult giraffe ranges between 16 and 20 feet in height, and male giraffes are taller than their female counterparts. The tallest male giraffe measures 20 feet, while their female counterparts measure 16 feet. According to the Giraffe Conservation Foundation, newborn giraffes measure six feet in height, and male newborns are taller than their female equivalents. Within the first year after birth, calves grow up to 12 feet. Part of the giraffe’s great weight comes from its long slender legs, which measure an average of six feet and are adapted to long-distance high speeds of up to 29mph, especially when defending their newborn calves. A giraffe’s legs are usually used for gait and defense against enemy attacks. When walking, the giraffe moves its legs on one side of the body, at the same time relying on the forward and backward motion of its neck and head for balance. Giraffes use their feet as a defense mechanism against predators by throwing enormous kicks with their front or hind feet. One kick from a giraffe's enormous hooves is enough to break a lion's back. Giraffes have a long sticky tongue that stretches up to 21 inches. The tongue is adapted to grasping twigs and branches of thorny acacia trees and shrubs, which are a great source of protein and calcium required to sustain the giraffe’s growth rate. The giraffe's elongated neck accounts for much of the vertical height. A male giraffe's neck can measure 7 feet, while a female's can measure 5 feet. Giraffes have seven neck bones, the same number as other mammals, and the length of the neck is the result of a disproportionate lengthening of the cervical vertebrae, not from the addition of more vertebrae. Charles Darwin’s competing browsers hypothesis suggests that the elongated neck was an adaptive measure for giraffes caused by the competitive pressure for food from smaller browsers such as the impala and kudu. Male giraffes use their necks as a weapon in combat in the necking behavior, which is used to establish dominance for greater reproductive success. In high intensity necking, giraffes swing their head, landing thumping blows on the legs and body of the opponent, until the winner emphasizes dominance by mounting the loser. To accommodate their massive body height, adult giraffes weigh up to 2,800 pounds, while young ones weigh 200 pounds at birth. This weight includes 25 pounds from the heart and lungs, which are the largest among land mammals, and air is circulated through their 8 foot long windpipe.